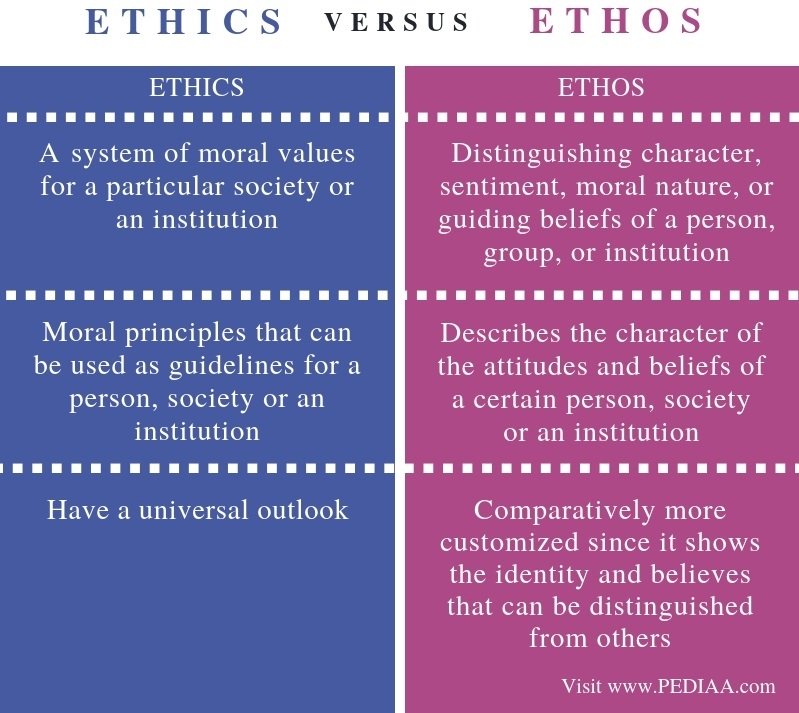 The main difference between ethics and ethos is that ethics refer to a set of moral principles while ethos refers to the character or customs or a set of attitudes and values. Ethics is derived from the word ethos. The two words ethos and ethics are linguistically linked as they share the same etymology. However, in the present world, these two words are used distinctly. Hence, ethics differ according to the individual, his social background, etc. However, ethics defines what are morally good and acceptable from a majority of society. For instance, the ethics in a certain society is originated with an alliance to their customs, traditions and religious beliefs as well. Hence, in this instance, ethos directly influences the formation of ethics. However, ethics in a general sense are those that are accepted universally; moral ethics, etc. Ethos is a Greek word that has meaning such as “character” or “custom”. Originally, this word was used by Aristotle to describe a man’s character or personality; a combination of passion and caution. However, at present, ethos refers to the guiding beliefs and values that distinguish a person, society or institution from others. According to Merriam Webster, ethos refers to the ‘the distinguishing character, sentiment, moral nature, or guiding beliefs of a person, group, or institution’. Thus, ethos mainly refers to the core set of attitudes, beliefs, and values that gives an identity to a person, community, institution, etc. For instance, the character identity of a certain individual in a society is a manifestation of that person’s outlook in life developed through his social traditions, customs, and religious beliefs as well. Another situation is when the business values of a certain institution can be distinguished from another; here, it is their attitudes and aspirations that contribute to formulating their business ethos. Hence, ethos can be explained as the characteristic spirit of a culture, era, or community as manifested by the attitudes and aspirations of its members. Both ethics and ethos share the etymology from the Greek word “ethos”, meaning character or custom. Moreover, ethics is derived from the Greek word ethos. Ethics refers to a system of moral values for a particular society or an institution. On the other hand, ethos refers to the distinguishing character, sentiment, moral nature, or guiding beliefs of a person, group, or institution. 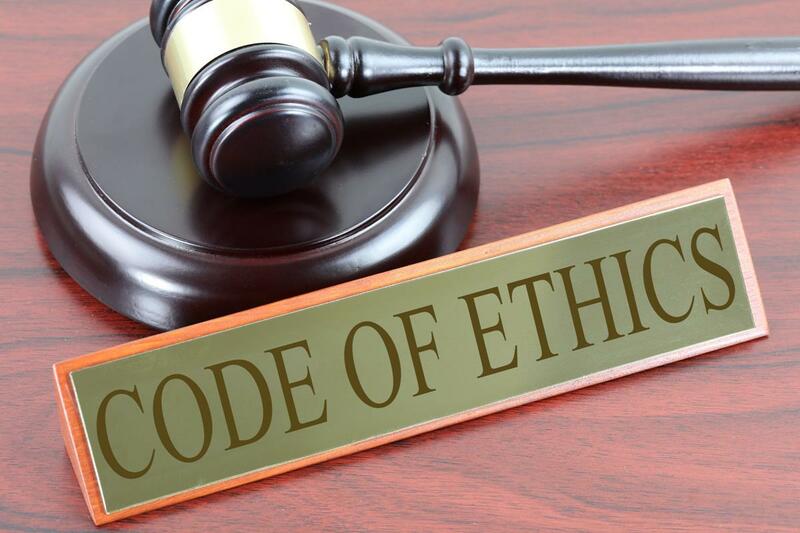 Ethics are moral principles that can be used as guidelines for a person, society or an institution while ethos describes the character of the attitudes and beliefs of a certain person, society or an institution. Thus, this is the main difference between ethics and ethos. Another difference between ethics and ethos is that the ethics have a universal outlook while ethos is comparatively more customized since it shows the identity and believes that can be distinguished from others. Ethics and ethos are etymologically linked words. Moreover, ethics can be identified as being derived from the Greek word ethos. Nevertheless, the difference between ethics and ethos is that ethics refer to a set of moral principles while ethos refers to the character or customs or a set of attitudes and values.